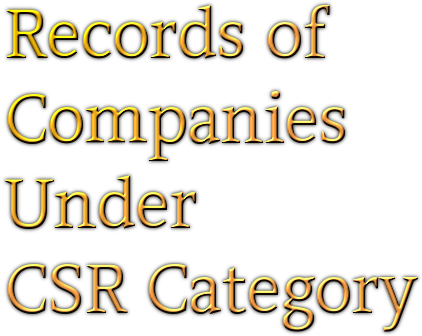 In terms of Section 135 of the Companies Act 2013, companies above the specified thresholds of turnover or net worth or net profit are required to spend at least two per cent of their average net profits earned during three immediately preceding financial years on Corporate Social Responsibility (CSR) activities. The Board of each such company is required to have the company’s CSR policy formulated and monitor its implementation or specify the reasons for non-implementation. The current financial year is the first year of implementation of CSR by companies under the aforementioned Act. Information regarding companies complying with CSR provision of the Act are expected to be available only after the mandatory disclosures of CSR expenditure are filed by companies towards the end of the year 2015. As Section 135 leaves the responsibility of implementation of CSR policy on the company itself it will not be possible for the Government to facilitate undertaking of such activities in particular areas. This was stated by Shri Arun Jaitley, Minister of Corporate Affairs in written reply to a question in the Rajya Sabha today.